Pasta al forno is the ultimate in rustic comfort food. "Forno" means oven in Italian, so as the name would imply, this is a baked pasta dish. Lasagne is the more common baked pasta, put this variation is absolutely worth making, a definite crowd pleaser. Because it can be made ahead of time, this is the perfect thing to serve when company is coming. If there are any leftovers, they are even better the next day. 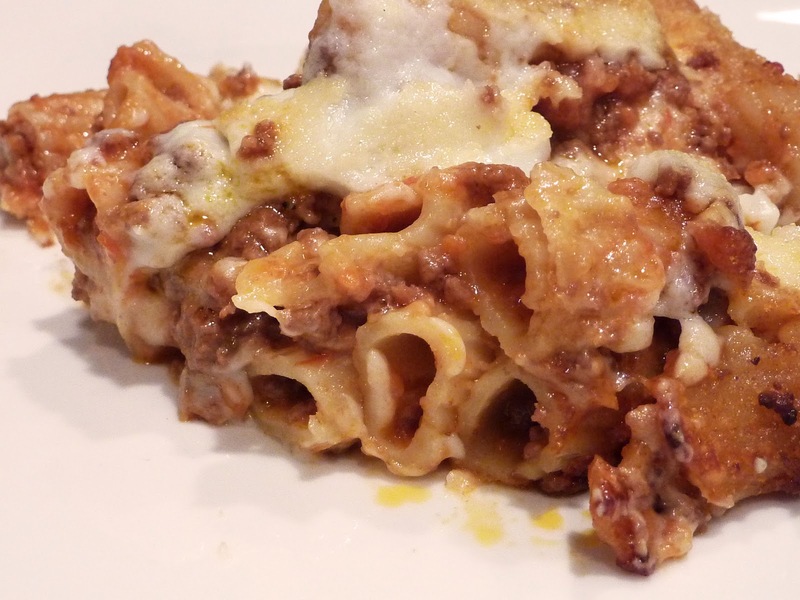 You need to first make the ragu (meat sauce), then prepare the besciamella and cook the pasta. Then you will be ready to assemble this delight. If you have a chopper, for me this is the easiest way to get started. In your chopper, put the carrot, celery, onion, garlic, and bacon. Cut the ingredients into uniform size pieces before putting in chopper. Then pulse the chopper until everything is pretty finely chopped. Heat the olive oil in a large saucepan, and when it is really hot, and the vegetable mixture. Saute over medium high heat until everything becomes nice and golden. Next add the ground meat, and stir occasionally until the meat is nicely browned. Add the red wine to the meat mixture. Bring to a boil, and stir regularly until most of the wine has been absorbed by the meat mixture. Add salt to taste. Now add the milk, and a little bit of nutmeg. Continue cooking until most of the milk been absorbed. Next add the chopped tomatoes, sugar and oregano. Stir all the ingredients together, then reduce the heat and let simmer for 1-2 hours if you can. The sauce should take on a brick red color. Sauce should be quite thick, but if is too thick, you can add a little bit of canned tomato sauce (puree) until you get your desired consistency. If the sauce will be used for lasagne, you need it to be thicker. Your sauce is ready! Next bring a large pot of salted water boil, and cook the rigatoni until it is still quite firm, quite al dente. Be sure not to overcook the pasta, as it will continue to cook in the oven as it is baked with the ragu. Drain the pasta and set aside until your besciamella is ready, and you are going to assemble the dish. Once the ragu is made, pasta drained al dente, and bescimella made, you can then assemble your pasta al forno. 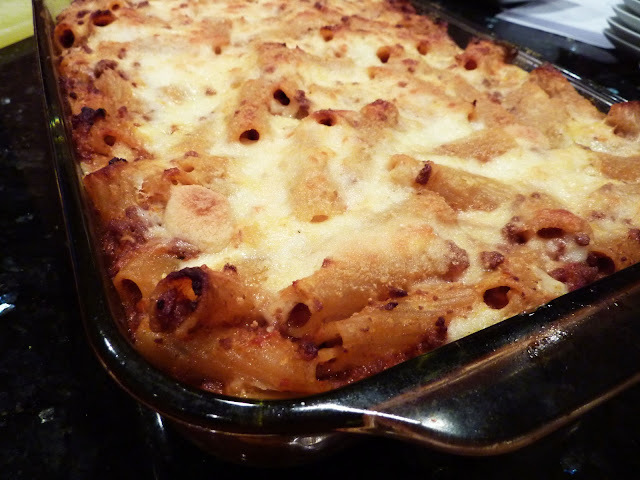 I usually use a 9 by 13 inch baking dish for this pasta, but you can use whatever oven safe dish you prefer. First put about a 1/3 cup of besciamella sauce on the bottom of your baking dish. Then in a separate mixing bowl, toss the pasta with the ragu sauce and about a cup of besciamella. Combine well. Then put half of the pasta with sauce in the baking dish. Layer another 1/3 cup of besciamella on top of the pasta. Finish with the remaining pasta and layer the remaining besciamella. Sprinlke generously with grated parmigiano reggiano. Bake in a 400 degree oven for about 40 minutes. Then the last 5 minutes, turn the oven to broil to achieve a nice brown crust on top. Watch carefully as it can burn easily. Let the pasta cool 5-10 minutes before serving. I am sure you will enjoy. Buon Appetito! Nice! Happy new year to everyone, and a great 2011! Thanks for that step-by-step procedure. That food is definitely delicious. I should really try that recipe sometime. I will try the recipe. I'll be glad also if you share other recipes. I prefer a gluten-free pasta. I make sure to make an extra layer of bechamel sauce every time. I tried this and my wife loved it. Thanks. This will be a great dish for Christmas. I love this pasta, thank you very much. I made this last night and my dad loved it. Thanks. This is so fattening but oh so delicious. I tried it out last week. Thanks for sharing the recipe. Is it like baked mac? I find delicious. I would really love to try the recipe you shared to us. Thanks!